I never called them xenophobes. I agreed with some points. You mentioned I've not discussed because I've not "agreed" with points. Even remotely open minded? Well, Mac, its because honestly I think that your posts are full of remarks that are ad hominen attacks. I think that you rely on a brand of undeveloped sarcasm. I think you'd rather people simply say "you're right" and then we will have a discussion. You've only had snarky statements. That's when I get rude. It's about the time you feel the need to try to attack and use sarcasm. Honestly, I do the research and my put out my ideas (some of which is actually agreement, some not. Only if they presented in a way where I'm not called a "commie", "delusion" or some other insult.) and thus I'm pontificating? Look, go to schools in Compton, San Bernardino, Santa Ana...tell me what you see. You'll see schools that are in horrible shape, with frustrated new teachers, old books, chairs built in the 1950s, and a scarcity of advanced classes. We don't hold the same standards. We don't. You want them to be assimilated and speak English. You don't want them on welfare. Why is it bad to educate? Why not raise the standards of our schools that are filled with many immigrants? Why do we have schools that are so shoddy that they resemble the third world? look, it's easier for me to make sure i get every point and address it all. the average home price in ca was signficantly higher than the national average. It was over 500k. A new family making the ca average family income could not get the average home. Even in the "affordable regions" ite was 400k. So its makes sense to move. Also, if you bought at 90k and now your home is worth 500k, you'd move to get a better house and more money. Doesn't that make some more sense than only moving due to immigrants? It could have an after thought, or even a secondary reason (which i kind of doubt, but you never know), but the main factor was money. i see what my family says and put it into context. My dad would complain about xyz and realize that his complaints were because they did not match the past. Does that mean the present is worse? No. It's simply different. Grafitti was at its peak in the 1970s. Clali was worse. Higher crime, worse smog, higher poverty, yet oddly it was at its whitest (70-80%). Hispanics were not in large numbers. California took a huge upswing during the 2000s when it was the poster child prior to 2007. You only like what you miss. long term residents who moved are typically reluctant of the changing demographics. It makes sense. It's not a bad thing. However, it still is (sometimes) irrational. Sometimes it is completely justified. I agree, if you lived in some communities you'd want to move. With that said though, most communities in california are nice. well clearly it did matter to you, otherwise you would care about the rise of spanish. If you care about the rise, then you care about the overall usage. Decline is a part of it. People learn languages really slowly. Esp. Adults. By the time we are full blown infants we lose the ability to distinguish languages as quickly. This distinction only accelerates. An effort does need to be made. I agree with you. But something is needed during the learning process. again it happens to me quite consistently. It is rude to pry into a private conversation. If it were an all english conversation that needed to be attended to, the people would simply leave. It's a private convo is again none of my business. don't pity me. These same people accused me of being a "terrorist" for being born in riyadh. These same people disrupt my life by telling me that i'm not american enough when i'm speaking in to my mom in french in front while standing in line at the supermarket, even though it's really none of their business what i'm saying. These are the same people that always complain about mexicans while eating mexican food. Instead of finding a solution to the problem, they make a list of things that are insignificant and irrelevant and rant online (the op of this thread is a great example...esp. Concerning about clothing...there is gap in california, it started here. Along with levi, dockers, american apparel, and others). people don't go home, they go to another state. Or they stay, because they realize they can still work in the black market. Illegalization of things just creates a black market. Labor becomes the product in this market. honestly, i understand what you are saying. You'd rather see lower numbers in general. I get it. It makes sense. Think about it another way. If you are so frustrated then you are more likely to do something dumb. Not having your family around is about as frustrating as it gets. Hence why people in these sitatuations (sending money abroad to their families) are more likely to commit a crime. So this is another consideration. our services are diluted because of mismanagement, not illegals. The parents are making money here, if you say no schools you create a class of undereducated people here. i'm again saying those leaving ca only on the basis of changing demographics. That's silly. Other than that, i wish the best to those that moved. But to say i'm moving because hispanics are here...that's kind of not okay. It's also not okay to say "whites this" "blacks that" or "asians this" etc. I mean it's superficial and really doesn't do anything worthwhile. (PS...I noticed that after my "rant" at you, you became a LOT more polite with Nightbird (above) than you previously were....almost like you 'lightened up', on your own volition. Amazing. Guess you just saw the error of your previous tone?..or that, in contrast to ME, nightbird just sounds suddenly a lot more 'reasonable' than he did before.......one has to wonder)..
Last edited by macmeal; 05-24-2009 at 10:10 AM..
Why do we have 'nice' schools and 'outdated' ones? I don't know. Why do we have 'nice' neighborhoods, and those marred by grafitti and discarded trash? I don't know that, either.....but I'm cofident you'll explain it....right after you explain how ANY of this relates to the 'rights' of those who are here illegally. Only the truly naive or foolish will not recognize the threat inherent in our open borders with Mexico. Why bother going through the time and expense of obtaining a tourist visa, or any other visa for that matter, when one can simply walk across our border with Mexico, as thousands do on a daily basis? C’mon, surely you can comprehend this. No, I believe you recognize the threat, but have a compelling need to defend Mexico and Mexican illegal aliens. In your mind, to acknowledge a connection between illegal immigration and terrorism would tarnish the image of Mexican illegal aliens, and validate our need for secure borders. I’m sure terrorists have also entered through Canada. However, I doubt if you would so fervently defend that border. Whether you choose to acknowledge it or not, our lax border security has made us vulnerable to terrorism. Terrorists are here, they are phenomenally patient, and eventually they will attack again; all courtesy of our open borders – an integral component of our cheap illegal labor industry. So yes, there is a connection between illegal immigration and terrorism. Calling it BS does not alter this fact; nor will it diminish the threat. The fact that ‘some’ of the 9/11 terrorists were here on visas (3 of the 4 pilots were here illegally), or that we have homegrown terrorists, does not negate the threat posed by our open borders. It only underscores the vast avenues available to our enemies, and our level of vulnerability. According to the INS, three of the 19 hijackers were here illegally on expired visas, and two were able to obtain valid visas despite being on U.S. intelligence agency watch lists. Even as we speak, tens of thousands of illegals from terrorist-sponsoring states are roaming the streets of America, according to a stunning new report from the Department of Homeland Security’s Office of Inspector General. The report reveals that 45,008 aliens from countries on the U.S. list of state-sponsors of terror (SST) or from countries that protected terrorist organizations and their members (SIC) were released into the general public between 2001 and 2005, even though immigration officers couldn’t confirm their identity. An al-Qaida operative who was on the FBI's terrorist watch list was recently captured near the Mexican border, housed in a Texas jail and turned over to federal agents, Rep. John Culberson, R-Texas, said on Friday. What about the Drug Cartels that are sneaking into U.S. cities from the Southern Border? They may not be "Al Queda" terrorists, but terrorists nonetheless.. The Obama administration says it will send hundreds of federal agents and crime-fighting equipment to the Mexican border in an effort to prevent drug-related violence from spilling over into this country. It’s a little late — the Mexican drug cartels are already active in 230 American cities. 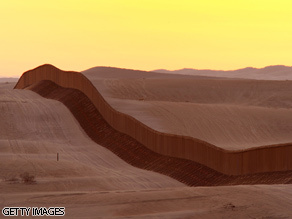 A section of the U.S./Mexico border fence crosses previously pristine desert sands between Arizona and California. Homeland Security may respond to escalating violence of warring Mexican drug cartels by deploying military personnel and equipment to the region. $700 million meant to bolster Mexican law enforcement and crime prevention efforts probably can’t come soon enough. The mayor of Phoenix says it’s a great first step, but “a drop in the bucket in terms of what’s needed.” Crimes like drug-related kidnappings and torturing are overwhelming the Phoenix police department. And Texas Governor Rick Perry had asked for a thousand more troops for parts of the border, saying he doesn’t care what kind of troops they are as long as they’re properly trained. [b]Meanwhile, the Justice Department has identified 230 U.S. cities where the Mexican cartels “maintain drug distribution networks or supply drugs to distributors,” and we’re not just talking about cities along the border here; they include places like Anchorage, Alaska, Atlanta, Boston and Billings, Montana. We are discussing illegal aliens. Why do you continue to conflate legal with illegal as though there is no distinction? We need better educational systems in this country FOR AMERICANS. We don’t need to focus on educating illegal aliens; let their countries of origin accept that responsibility. However, we DO need to focus on viable methods for removing them from this country. BTW, a complete post in red is hard on readers’ eyes.